Abstract: A high initial priming dose of the novel RNAi therapeutic GS-10 was investigated as a strategy to elevate important RISC complex proteins that have the potential to increase efficacy of subsequent RNAi treatment regimens in solid tumor cancers. GS-10 is a tumor-targeted 20 nm crystalline capsule bearing single-stranded RNAi oligos against Protein Kinase CK2 (CK2), and a ligand-coated shell derived from Tenascin-C (tenfibgen). Tenascin-C is upregulated in multiple solid tumors, and is a promising targeting ligand for tumors throughout their lifecycle. The ultrasmall capsule size enables efficient raft-mediated delivery of oligos to the perinuclear space of the target cell, and the ability to reach metastases without reliance on EPR. To date, strategies for RNAi-treatment of solid tumor cancers have been sub-optimal due to, at least in part, the varied levels of RNA degradation machinery across patients, tumors and tissues. For example, we have found wide variation in Ago2 protein levels, a key RISC component for RNA cleavage, in human head and neck cancer (HNC) tissues. Here we investigate a strategy for overcoming this limitation for an RNAi therapeutic in solid tumors. We have previously established that SQ doses of GS-10 at 10-100 μg/kg/day have antitumor efficacy, coincident with CK2 protein knockdown, in several mouse models. In an SCC-47 HNC xenograft model, tumor growth inhibition of 86% was observed after GS-10 treatment compared to controls, despite low baseline Ago2 levels. Interestingly, these tumors express relatively high Ago4 levels. FISH analysis of GS-10-treated SCC-47 tumors revealed numerous punctate structures containing mRNA CK2 transcript. Similarly, structures containing Ago4 and GW182 were observed by confocal microscopy, altogether suggesting these RISC proteins mediate transcript sequestration by forming GW-bodies, resulting in tumor inhibition. Now, we are evaluating a strategy using high-dose IV bolus injection as priming to elevate expression of multiple RISC proteins, including Ago2, Ago4 and GW182, in the SCC-47 model. A priming dose of GS-10 at 10 mg/kg showed a 4-fold increase in Ago2 levels in primary tumors vs. treatment controls at 72 hours post-injection. Similarly, a 2-fold increase in Ago4 and GW182 levels was also observed. To establish that GS-10 was reaching tumors in vivo to induce these changes, distribution of an isotopic tenfibgen surrogate of GS-10 to primary tumor and lymph node metastases was confirmed following IV bolus administration. Additional RISC protein and tumor efficacy data from a later timepoint is being analyzed and will be reported. 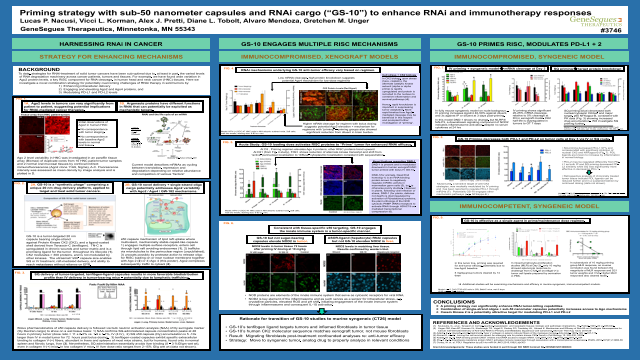 In summary, these data suggest that high-dose IV priming with GS-10 can elevate multiple RISC proteins, setting tumors up for more effective response to subsequent low-dose treatment using this novel therapeutic candidate.Summary: This poster investigates a novel combination strategy for potentially overcoming challenges of RNAi therapy in solid tumors using sub-50 (aka CUSP) nanocapsules to enhance intracellular delivery and access to Ago mechanisms. Casein Kinase 2 is also shown as a potentially attractive target for modulating PD-L1 and PD-L2.References: (1) Koukoulis, G., et al., Tenascin in normal, reactive, hyperplastic and neoplastic tissues: biologic and pathologic implications. Hu. Pathol, 1991. 22: p. 636-643. (3) Adachi, E., t. Hayashi, and P. Hashimoto, Type V collagen in splenic reticular fibers of the macaque monkey. Acta Anat.,1987. 129: p. 167-175. (4) Ahmed K, et. al., Joining the cell survival squad: An emerging role for protein kinase CK2. Trend in Cell Biology 12: 226-230, 2002.